Back to business. Do you know what I love about summer? There are so many great things to do. Do you know what I hate about summer? I can’t do all the things. It’s just so much. All that is just what I’ve got from the top of my head. Surely there is even more going on tonight, and pretty much every night during this season that Albanians find themselves out of doors. To make matters more complicated, the CSA deliveries have begun for the year, so that means I’m going to be under some amount of pressure to cook and consume this magnificent bounty of seasonal produce from Roxbury Farm. That said, it’s not a burden. At all. It’s a remarkable pleasure. Let me show you. Welcome to the first salad of summer. Okay, fine. I had that crab salad at Henry Street Taproom, but that doesn’t count. That was all about crabmeat, buttermilk dressing, grilled corn, and crisp potatoes. As you can tell from the picture above, this one is all about the lettuce. It’s an amazing turnaround that I went from a salad hater, to a salad lover. Of course, I only love salad in the summer, and still scratch my head when people order salads the rest of the year. The leaves are just bursting with life. They are delicate, but firm. They have great flavor. And require nothing more than a simple dressing of salt, plenty of good oil, and a splash of great vinegar. 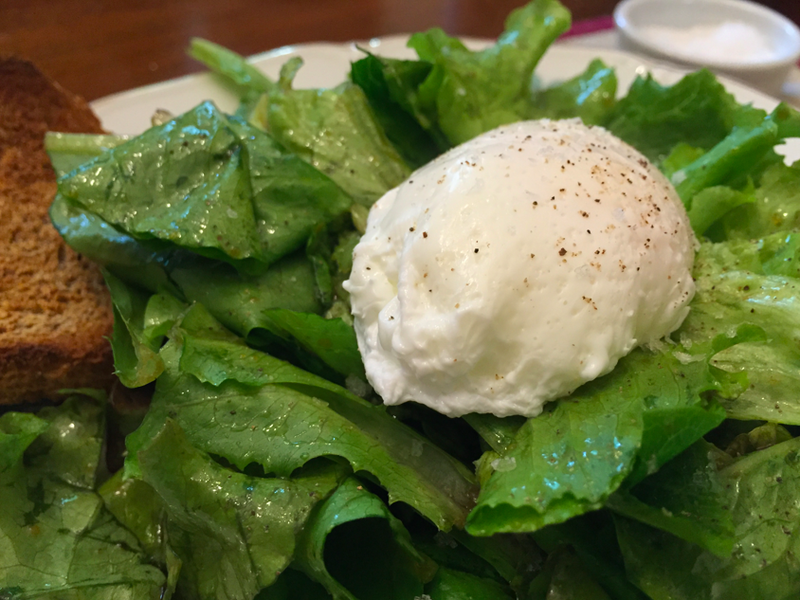 Adding a poached egg and a slice of 100% whole grain toast turns it from a side dish into a meal. The warm silky yolk also makes it feel like a decadent treat. When it comes to the CSA, salad greens are one of the first things that need to be used. We got head lettuce this week, but that will hold for a couple of days. The loose greens will start to fade immediately. Basil also fades, even though it’s on the stalk. Given the busy schedule, and the few nights we can have a family dinner this week, I pulsed that basil with some pine nuts, garlic, and olive oil in the food processor. Now it’s frozen, and will become an aromatic pesto sometime this winter when mixed with grated cheese. While I had the food processor out, I also took the parsley and turned it into my favorite pungent spread. It’s kind of like a cross between a chimichurri and salsa verde, since in addition to capers and anchovies, it also contains a generous squirt of lime and plenty of red chili flakes. This parsley puree gets spread on my morning toast, before brushing my teeth, and knocks the sleepiness right out of me. The kohlrabi slaw is just going to have to wait. That was also going to use up the raddish, green onion, and cilantro. I suspect it will get a southeastern asian profile with rice vinegar, brown sugar, and peanut oil. But when I make slaw I don’t follow a recipe, I simply taste and adjust. Man, there are still a lot of vegetables to eat. And I’m out of the house tonight and Saturday. Leaving just Friday, Sunday, and Monday to finish up a massive amount of remaining produce before the next delivery. Fortunately, once again we split the share with a friend, which means we’ve got an extra week to get it done. And there are plenty of items that will hold well like turnips, russian kale, zucchini, and head lettuce. Seriously, it may even be a push to eat through all of this bounty in two weeks. But that’s largely because of our stupid schedules and picky kids, who eat fewer vegetables than they should. For example, they don’t get any of the salad greens. Although I’m fine with that. Some things, like my pungent parsley spread and my Thai-inspired kohlrabi slaw are too good to share. What do you mean first salad of summer? This should be one of your last salads of peak lettuce season. Even with the weird weather this year my best salad greens are harvested/about to be harvested… There are some hot weather salad greens that I like, but come July/August any other stuff still in the ground is a bitter bolted mess (unless you shade them or something I guess…). Aren’t you Mr. Seasonal? Good salad greens are a spring food… Last year I grew mizuna all summer which is a good hot weather green. Didn’t plant any this year though. So, you’ve come around on the microwave and now have one in your home, and you’ve also changed your mind on salad. Now allow me to nudge you toward gardening. See, when you plant a basil plant the leaves don’t ‘fade’. You pick basil leaves off the tree and eat them moments later. Same for tomatoes, cucumbers, peppers, peas, and on and on. I don’t care how excellent your CSA is, if you want truly fresh veggies, you MUST plant a garden. Period. Sounds delicious! Did you consider splitting the share so you both get 1/2 each week rather than the full load every two? That works for some people, but the level of coordination it takes to execute is beyond my abilities at the moment. While the amount of food we get at each pickup is tremendous, this method is still a better choice. Cool! Enjoy! Ferment stuff in crocks!